Home » General Health » Long-Term Health Benefits of Knitting: Stress Reliever, Memory Booster and More! I remember when my grandmother used to knit socks in her spare time and my brother and I were steadfastly glued to our coloring books. These days, coloring books have been replaced with coloring apps. And the only knitting my grandmother does now is knit her eyebrows at her “iPad.” Oh how times have changed! Thankfully, last week when I went over to my parents’ place, I found them both intensely hovering over old coloring books—they were showing my nieces and nephews the good old-fashioned way to keep their minds entertained. My sister-in-law, who’s 33, was sitting in front of the television knitting, working on what seems like the world’s longest scarf. It seems simpler hobbies are making a comeback! My family members may not know it, but they’re actually all on to something that can have some major health benefits. In fact, there is evidence to suggest that creative activities like knitting, crocheting, and coloring can help people reduce stress, quit smoking, lower their heart rate, blood pressure, and cortisol (stress hormone), cope with bad news, improve their cognitive function, and boost self-esteem. The benefits of these time-consuming, creative endeavors largely stem from the fact that they produce a tangible outcome that you can feel good about, as well as provide an engaging place to focus. Taking time to sit down and knit, for example, can provide an excellent opportunity to be in the moment and remove you from the stresses surrounding you. The needlework keeps you busy while attracting your attention. Some say it provides the same level of relaxation associated with meditation or yoga—with the added benefit of providing a sense of accomplishment. Aside from these benefits, keeping your hands busy may also help you cope with stress, quit smoking, and even control weight. After all, it’s hard to mindlessly snack when your hands are busy and your mind is engaged. There are even some people who find it effective for treating chronic pain. I’m not trying to suggest that coloring, knitting, and crocheting are the be-all and end-all of alternative health treatments, but their impact can be pretty impressive. Let’s take my dad, for instance, who recently turned 70-years-old. For the last two months, he’s been experiencing some health complications, which we largely believe are stress-related. And, of course, winter always means you’re stuck inside more often with not much to take your mind off of anything causing you stress. Well, my dad picked up a few coloring books recently and his symptoms have improved drastically. He’s happier and more upbeat and the dizzy spells are waning. It’s interesting, because my dad has always kept his brain working. He loves to read and listen to music, but these things were not enough. In fact, studies in the Journal of Neuropsychiatry and the Journal of Clinical Neuroscience found that people who engage in crafts have a smaller chance of developing cognitive impairment. People who read or play music don’t get the same kind of benefits. 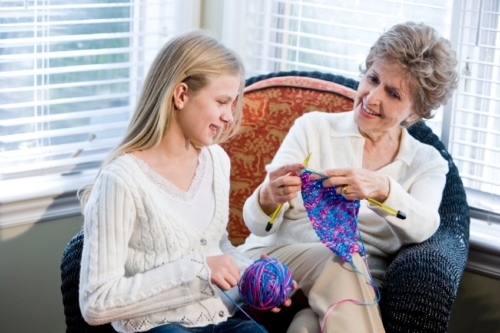 Who knew that there were so many long-term health benefits of knitting and crafts? Regardless of your age, there appears to be some real benefits to creative endeavors like knitting, crocheting, and coloring. After the learning curve, it could be an easy—and fun—way to relieve stress and improve your overall health. Brody, J., “The Health Benefits of Knitting,” The New York Times web site, January 25, 2016; http://well.blogs.nytimes.com/2016/01/25/the-health-benefits-of-knitting/?ref=health&_r=0.